Shane Colton: FFv1.1: Air, Land, and...well that's it. FFv1.1: Air, Land, and...well that's it. FFv1.1 is the new minor revision of my small motor controller, which has so far tested successfully on the Cinestar hexrotor motors. 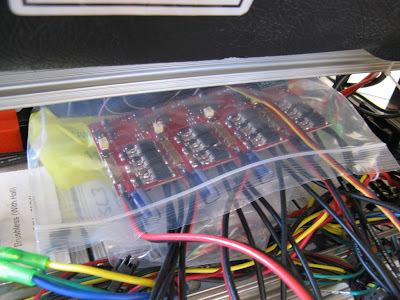 The controller is sized for 24V (6S LiPo), 30A continuous and 60A peak current, and uses the same Sensorless, Sine-Commutated Field-Oriented Current Control (SSCFOCC) that I've been using on Pneu Scooter. 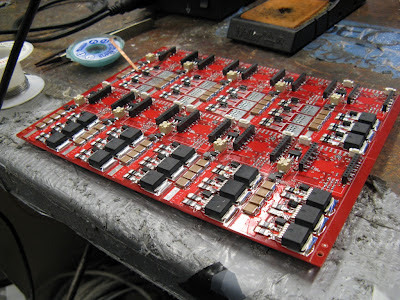 Instead of two 10mm electrolytic capacitors sticking up at a weird angle, I opted for a bank of large 50V ceramic capacitors, eight in total, on the board. The ceramics are more expenisve, but they should also improve the high frequency filtering of the DC bus. Because they are much higher cost per energy, I also planned to use a single large electrolytic capacitor sticking off the side of the board. 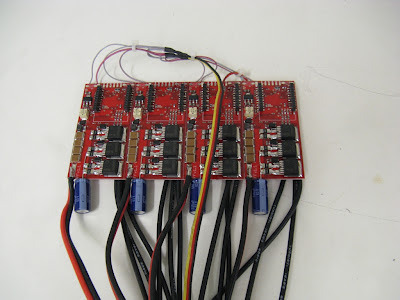 One problem with developing a controller that might be used on a hexrotor is that you need six of them. 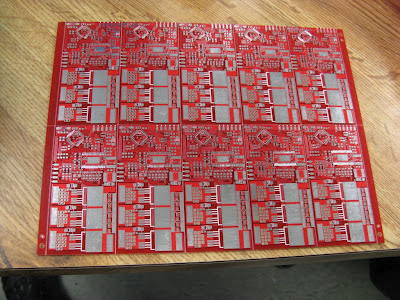 So, for v1.1, I got a 5x2 panel of boards from MyRO, a not-shady Chinese board manufacturer (~2 week turn). At this point I should thank the folks from FreeFly Cinema who donated the Cinestar frame and backed the first round of FF controller development. 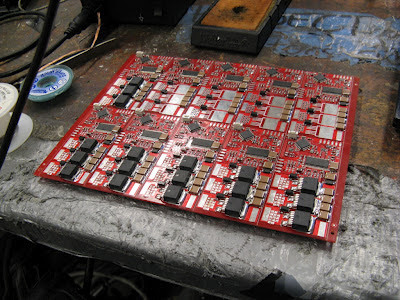 The individual boards are v-scored, so they're easy to break apart by hand. 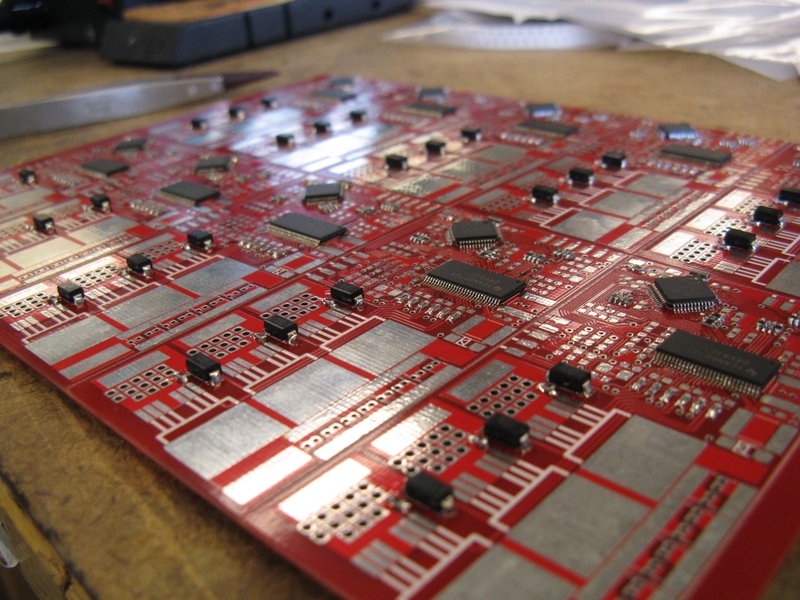 One reason I wanted to get the boards as a panel is so that I could batch-process the soldering. And damn, it was a lot of soldering. I mostly solder everything by hand with a magical Weller WD1001 station, but in order to do the DRV8301's power pads, I used paste and a reflow oven. 95% finished Side 1. This side has the XBee radio headers. 95% finished Side 2, with the microcontroller and gate driver. In total, it took about 14 hours of soldering spread over three days and not including the time to attach wires and connectors to the finished boards. It's probably the second longest soldering job I've ever done. But I think I probably cut the time in half by doing the whole panel at once instead of working with individual boards. The three blue wires are motor phase outputs, the red and black are DC inputs, and the three-wire connector is the servo-style PWM input. There's also a 6-pin header for programming with an FTDI adapter, although so far I've been programming wirelessly by XBee. In this configuration, the total footprint not including wires is 4.25"x1.5"x0.5". Without the programming header and electrolytic capacitor, the minimum footprint is 3.0"x1.5"x0.5". 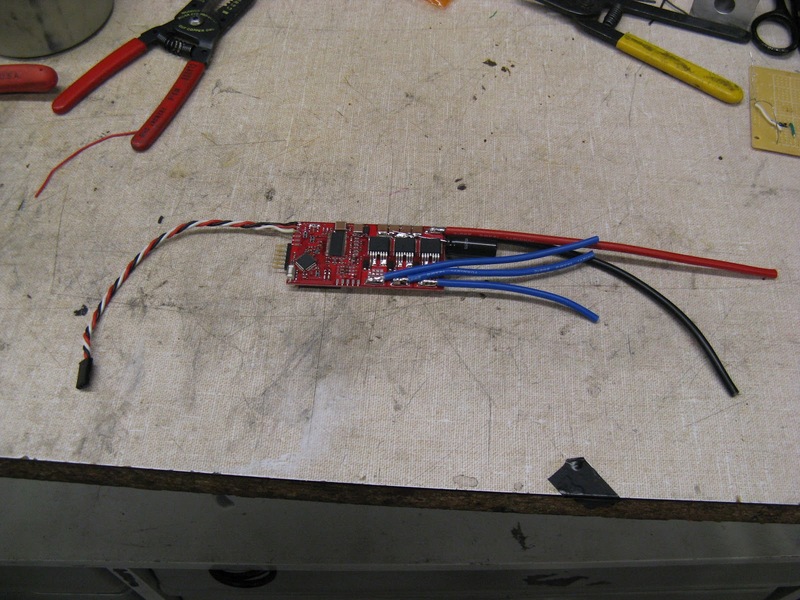 The weight including wires and connectors is about 65g. It's probably a better idea than a McMaster-Carr bag. 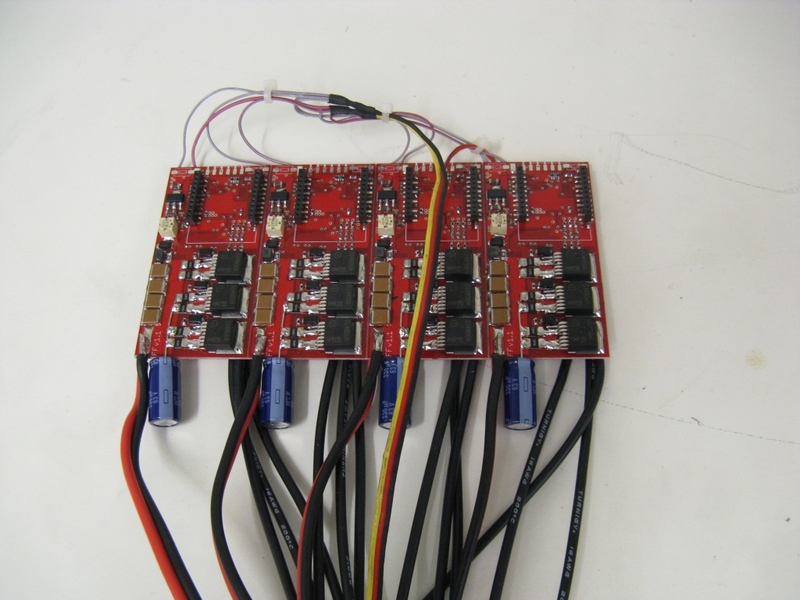 After some initial testing (video below), the controllers performed well with 25A peak current but had trouble ramp-starting all four motors at the same time. 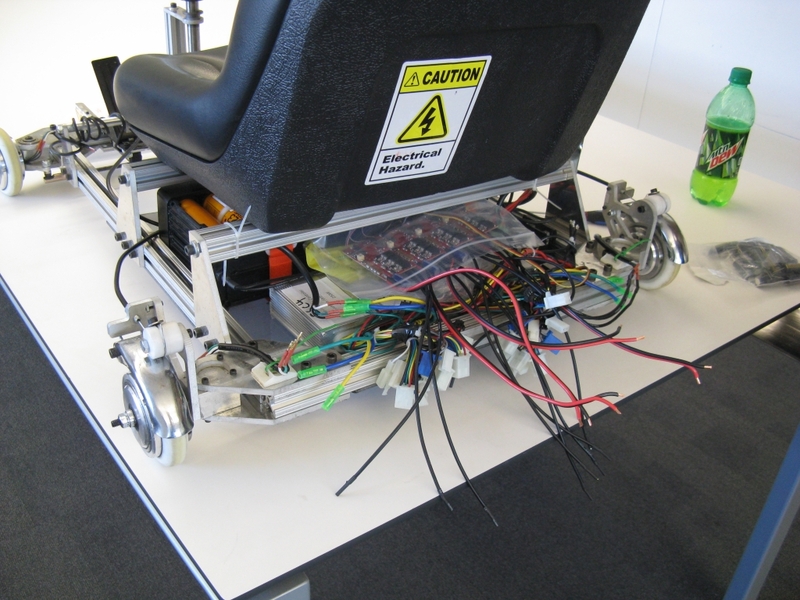 The eBay controllers can do it on level ground, but with limited torque for the first instant while the back EMF zero crossings are still noisy. My eventual goal is to have a sensorless start at full rated torque, although it may require more than simple open-loop ramping. For scooter (or e-bike) use, the simple ramp start or a manual push start would be sufficient. The regenerative braking on pedal lift had a nice feel. I'm eager to implement a better ramp-start and get tinyKart running on sensorless DirectDrive like I've been saying I would do for months. 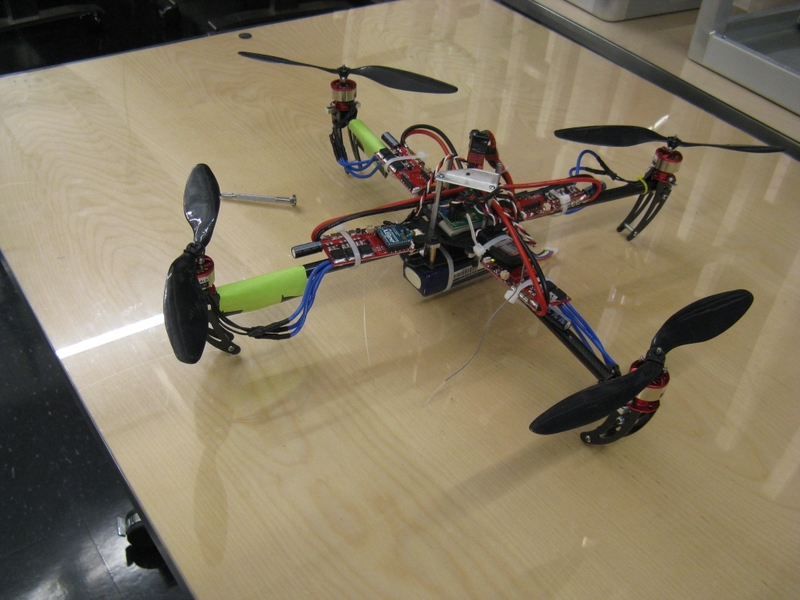 But for now, back to multirotors. The main purpose for the other six FFv1.1 boards is to test fly on the Cinestar 6 hexrotor. Before I feel comfortable enough to do that, though, I decided I should flight test the controllers on my Turnigy Talon quadrotor. It's a much more manageable size (500mm from center-to-center), but it can carry a substantial payload so it wouldn't mind the extra weight of large controllers and heavy-gauge wiring. To accommodate the output signal from the KK multirotor control board, I wrote a simple PWM input routine using a spare timer on the STM32. 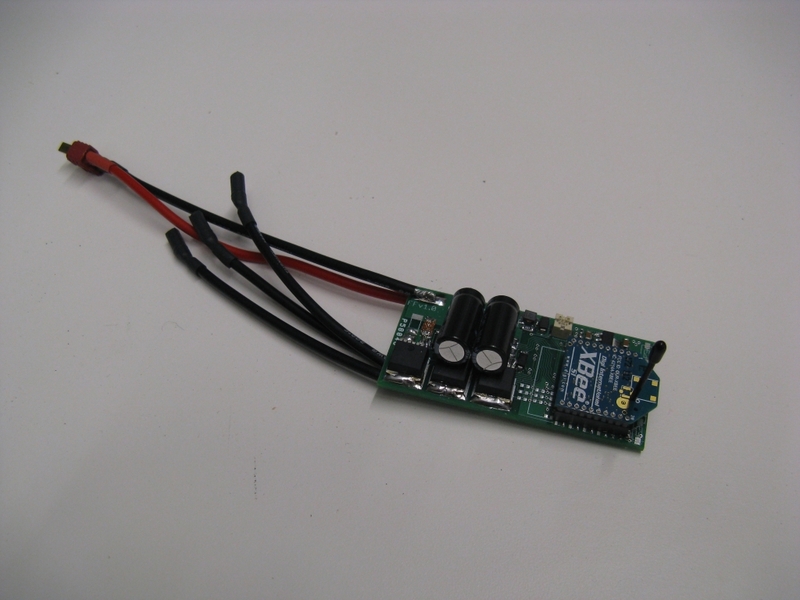 It measures pulse length and adjusts voltage magnitude directly (no current control.) However, the voltage phase is still feedback-controlled to keep d-axis current at zero. This is a unique control scheme not possible with normal Field-Oriented Control. It should retain the "feel" of an airplane-style RC ESC but have optimal torque per amp at all speeds. For the PWM input, I used a digital low-pass filter to limit the spin-up rate of the motors. I initially did this in lieu of current control to limit the maximum amount of current the motors would see under normal operation. However, after flying with a relatively fast input filter (τ = 33ms), I encountered the other reason why one might want to filter the input: vibration noise. The PWM input under hover conditions would actually fluctuate by about +/-50μs (+/-8% of full range). This noise is almost certainly from the gyros on the KK board, and I don't blame the cheap controller because I had major gyro noise issues with the Pololu minIMU-9 too on 4pcb. Gyro noise due to mechanical vibration has been by far the most hassling part of building multirotors for me. 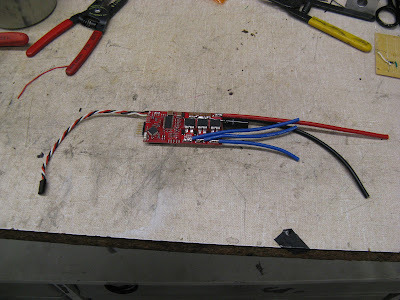 In any case, it was actually beneficial to increase the input filter time constant to about 50ms and turn down the control gains slightly to reduce how much the ESCs would amplify the gyro noise. So far the controllers are working as planned. This marks the first time I've ever tested eight controllers in one day without blowing anything up.